Editor’s note: This is Part 2 in Spend Matters’ three-part series covering Deloitte’s 2018 Global Human Capital Trends Report. As the nature of work changes, so too does our understanding of careers. This is one of the most important trends covered in Deloitte’s 100-page 2018 Global Human Capital Trends Report. While 84% of respondents who took part in Deloitte’s survey deemed the ability to build a 21st-century career as “important” or “very important,” only 37% think they are ready to do so. Part 1 of this series covered C-suite, contingent workforce and compensation trends. Today’s post will discuss four more trends in human capital: corporate citizenship, corporate wellness, longer careers and the redefinition of the career itself. As more and more industries begin to adopt artificial intelligence and automation, the most important job skills may not be technical ones but rather those that require emotional intelligence and provide what machines cannot. As skills become obsolete at a faster rate, it is time to rethink the traditional career ladder, the Deloitte report suggests. Instead, professionals will need to continually develop new skills and reinvent themselves and what they can offer. The survey findings suggest that this reality is already here. Almost three quarters of the respondents say that career paths at their organizations do not conform to a traditional organizational hierarchy. Despite this, organizations’ development programs are still based on such hierarchies. About three out of five respondents consider their organizations ineffective or only somewhat effective in empowering people to manage their careers. A possible solution is for companies to build a culture of learning, the report authors suggest, citing previous research showing that companies that “practice a growth mindset… and openly discuss mistake to promote learning are three times more profitable.” Some large companies, such as Visa and IBM, are already doing this, setting up learning networks and knowledge-sharing systems. Related to the issue of careers versus pathways is the matter of longevity. It is estimated that by 2020, 13 countries — including France, Japan, the U.K., and the U.S. — will have populations where one in five people are 65 or older. As life expectancies rise, careers are becoming longer and the workforce older. Companies will need to adapt to employees whose careers have spanned “generations of technologies and businesses,” and employees will need to continuously adapt to changing workplace trends. Forward-thinking organizations are approaching this trend by creating new development paths and new roles to accommodate older workers. While only 18% of respondents say that age is viewed as an advantage in their organization — which may very likely be a result of ageism in the workplace — 16% report that their companies are creating special roles for older employees. Call it backlash or an inevitable consequence of “corporate personhood,” corporations are increasingly expected not just to make profits but also to address social problems and meet societal needs. The Deloitte report refers to this idea as corporate citizenship, and 77% of the respondents consider it “important” or “very important.” Better yet, 51% think that organizations are “ready” or “very ready” to meet these expectations. The report pinpoints a number of factors that may be driving this trend. One is that it is simply easier to unearth and broadcast bad behavior. “Any mistreatment of customers can be instantly filmed and shared with a global audience,” the report’s authors point out. Another driver behind the corporate citizenship trend the millennial generation’s high expectations for corporate behavior. Earlier Deloitte research has found that 88% of millennials believe that corporations should help alleviate problems such as income inequality and harm to the environment, and 86% say that profitability should not be the only measurement of business success. Deloitte’s survey findings suggest that there is much progress to be made among organizations worldwide. 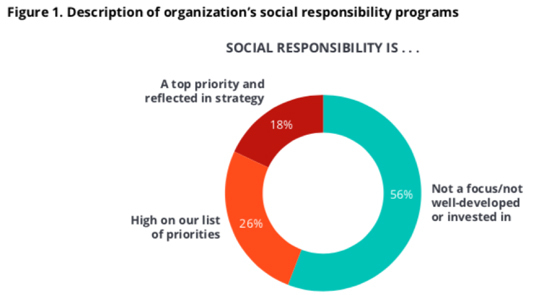 As the graph above shows, more than half of the respondents say that social responsibility is not a priority for their organizations. The traditional idea of a work-life balance seems almost quaint when one considers how blurred the line between work and life has become. Digital technology has made it possible for many employees to take their work home with them, never truly disconnecting. As a result, the current wellness trend is likely here to stay. The corporate wellness market is expected to reach $11.3 billion by 2021 in the U.S. alone, and two-thirds of organizations consider wellness programs to be an important part of their company culture. Differences remain, however, between what employees value in terms of wellness and what their employers offer. Eighty-six percent of respondents consider having a flexible schedule to be “valuable” or “highly valuable,” but only half of their organizations offer it. While many factors may prevent an organization from offering flexible hours, there are small steps companies can take to make their employees happier and healthier — starting with snacks. Nearly two-thirds of the survey respondents simply want healthy snacks. What — if you will excuse the metaphor-turned-bad-pun — better exemplifies “low-hanging fruit”? The full Deloitte report is available for download here.